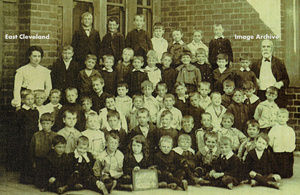 A school photo taken about 1902-1904 Lynda Robinson who loaned us the photo (thank you Lynda) tells us, second row from the top left to right, school teacher then John Barret he would have been the oldest boy in the school. He was 3 or 4 years older than my father Charles Ditchburn born 1897 standing next to the headmaster on the right, whose name may have been Mr Dadd or Mr Dann. Can you see anyone you recognise on this photo please tell! Image courtesy of Malcolm Ditchburn (son of Charles Ditchburn in the photo) it was brought to us by his daughter Lynda Robinson. Many thanks. There are very few young ladies in this photograph! Would that be something to do with social attitudes at that time? Maybe there was a degree of segregation at the school or perhaps there was a subscription required and the girls were a low priority….